A full-scale tidal power generator aimed at showing the potential for renewable energy has been unveiled in Pembrokeshire. 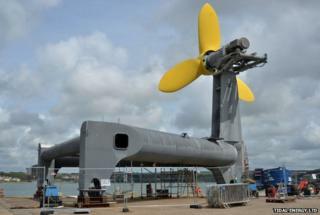 The underwater turbine in Ramsey Sound will run for a 12-month trial, with its energy powering homes in St Davids. First Minister Carwyn Jones hailed it as a landmark project, creating jobs and helping meet green energy targets. Cardiff-based developers Tidal Energy Ltd hope it will support the case for a larger scheme involving nine turbines. The 150-tonne demonstration device with a frame as high as a seven-storey building has been built in Pembroke Dock by Mustang Marine, recently saved from administration. It will generate energy from tidal currents on the sea bed. Tidal Energy Ltd claims the patented DeltaStream device will be Wales' first grid-connected freestanding tidal turbine. Managing director Martin Murphy said the unveiling of the generator was a significant milestone, marking "the birth of the tidal industry in Wales". First Minister Carwyn Jones unveiled the turbine on Thursday, having supported tidal energy as an alternative to fossil fuels. He said: "We need to show the world we are able to harness the considerable energy that exists in our seas and that we are able to develop the technology necessary to do that. "This is a landmark project for Wales, which will not only help us to meet our sustainable energy ambitions, but will also provide significant opportunities for local people and businesses," he said. Power generated by the 400kW demonstration device - to be installed within a matter of weeks - will be fed into the National Grid and used to power nearby homes. The turbine, located in a Marine Special Area of Conservation, includes design features aimed at minimising the impact on the environment. The project has been supported by £8m of European Union funding, matched by majority shareholder Eco2 Ltd. The company is planning a larger 10MW scheme involving up to nine turbines off St Davids Head, which would generate enough power for 10,000 homes. Other tidal energy schemes in Wales include a £70m project off the coast of Anglesey due to open in 2016 and a £650m tidal lagoon proposed for Swansea Bay.